The best approach to learning is playing. This is also true for WordPress. 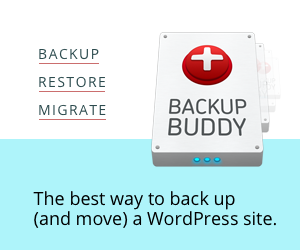 Even when you have mastered WordPress and your blog is up and running steadily, it is good to have a local WordPress installation for testing new versions of WordPress, themes and plugins. Or develop new websites. Your own, or your clients’. A prerequisite for a local install of WordPress is a local web server. When you do not have a local web server yet, Install a XAMPP web server on your Windows PC in five easy steps will show you the way. Here we are going to install and configure WordPress on a local web server, so I assume you have one. 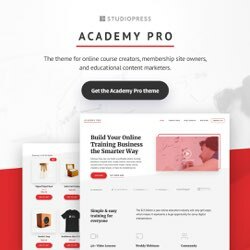 The best place to get a recent copy of WordPress is WordPress.org. There is even a shortcut that will always deliver the latest, stable version as a zip file. Currently, that is 4.1.1. Extract the zip file when the download has finished. You end up with a folder named wordpress. Now we have to move the wordpress folder to the document root of the local web server. When you have followed along with the post Install a XAMPP web server, you have to move the folder to C:\xampp\htdocs. Rename the wordpress folder by giving it the desired name of your local website. 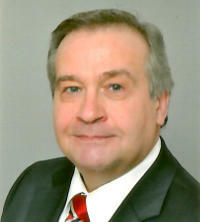 You will append that name In the address bar of the browser to http://localhost/. In this example, I name the WordPress folder wpfyme. That is it. The WordPress site wpfyme is now installed. Before we continue configuring the WordPress site, we have to create a MySQL database and user. We need a database to store our content and the configuration settings of WordPress, themes, and plugins. In addition, we need a user with the proper privileges to access and modify the data in the database. Make sure that the web server is running. Fire up your browser and enter http://localhost/phpmyadmin in the address bar – or click the link. This will launch phpMyAdmin. 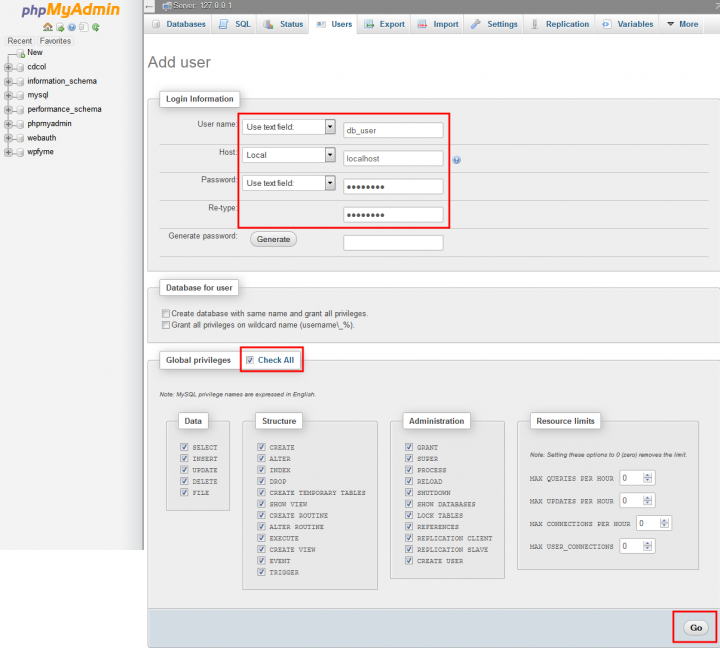 In phpMyAdmin, click the Database tab at the left side of the horizontal navigation bar as shown in the image above. Enter the name for the database of your local website in the “Create new database” field. On local installs I prefer to assign the same name to the database and the website folder inside htdocs. This is not necessary, but it makes pairing a local site and its database a lot easier – especially when you have a couple of dozen on your PC. Here, I enter wpfyme. Hit the [Create] button. A confirmation message pops-up, and the new database appears in the left sidebar. You see a list with the current users. Hit the Add user link just below the list. Done. You have created a MySQL database and a MySQL user. 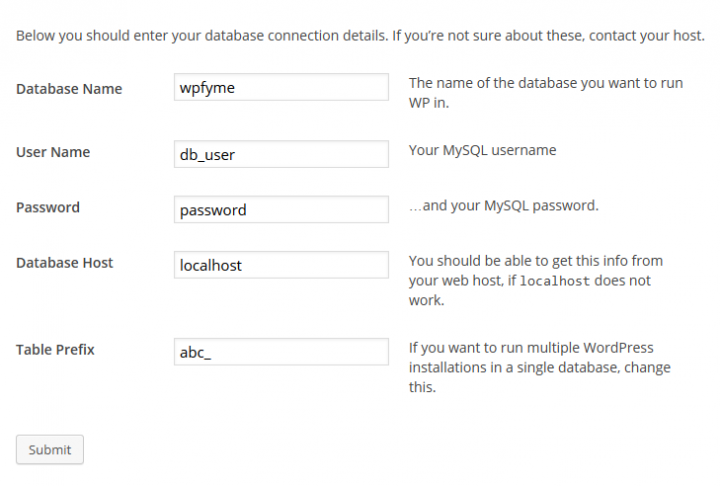 Remember the database and user name, you need these for the configuration of WordPress – the creation of the wp-config.php file. Are you ready for the final sprint? Enter the name of the local website in the address bar of the browser – that is the name you have given to the WordPress folder in htdocs. For me that becomes http://localhost/wpfyme. 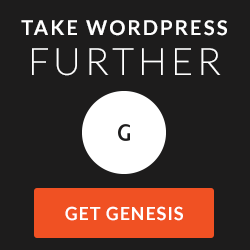 WordPress replies! 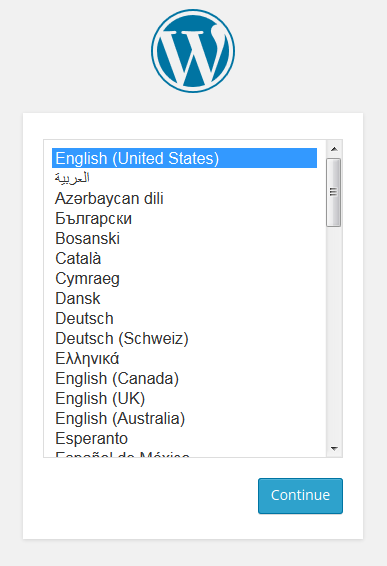 Select the language in which you want to install WordPress. The upcoming dialogue screens will be presented in the same language. Here, I accept the suggestion – English (US). Make your choice and hit the [Continu]-button. The Welcome to WordPress screen appears. 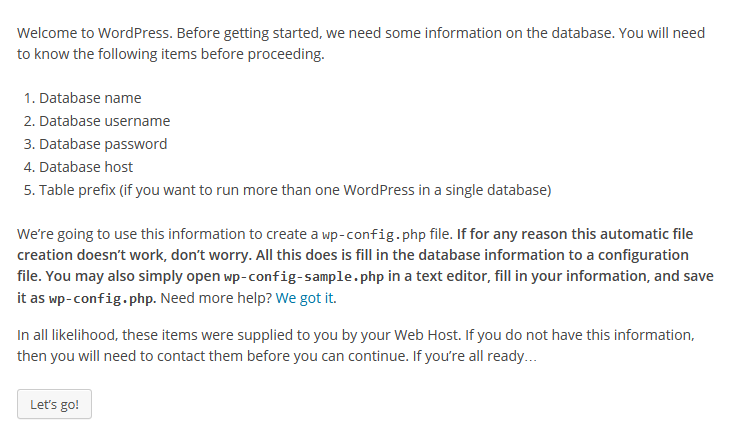 WordPress did not find a wp-config.php file, so it informs us that we are going to create one. Press the [Let’s go!] button. In the next form, as above, you enter the database, user name, and password (as created in Step 3), and a table prefix. By giving the tables of each WordPress website a different table prefix, you are able to store data from several WordPress installations in the same database. 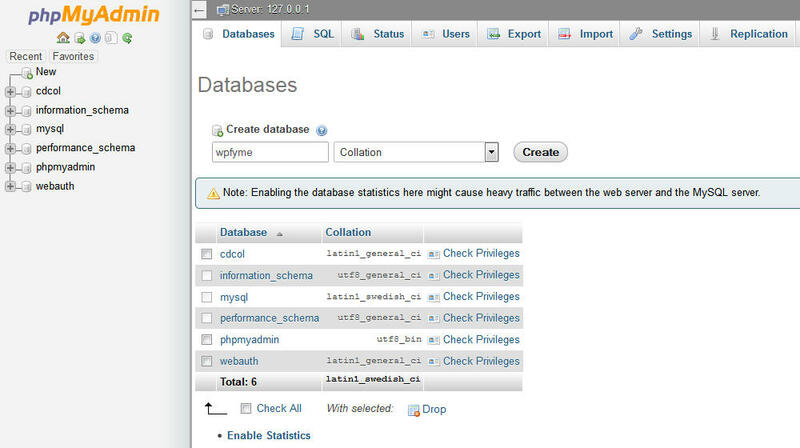 Most of the time this is not very practical or necessary, but it could be a workaround when you exceed the maximum number of databases with you host. The default table prefix is wp_, but is it advised to create your own. Press [Submit]. No we have a wp-config.php file, stored in the WordPress root folder. When everything is entered correctly, you encounter an encouraging message. Otherwise, verify the details in the form above with the database details (database name, user name and password) as created in Step 3. Hit the [Run the install]-button. Just one more form before you can log in to WordPress. 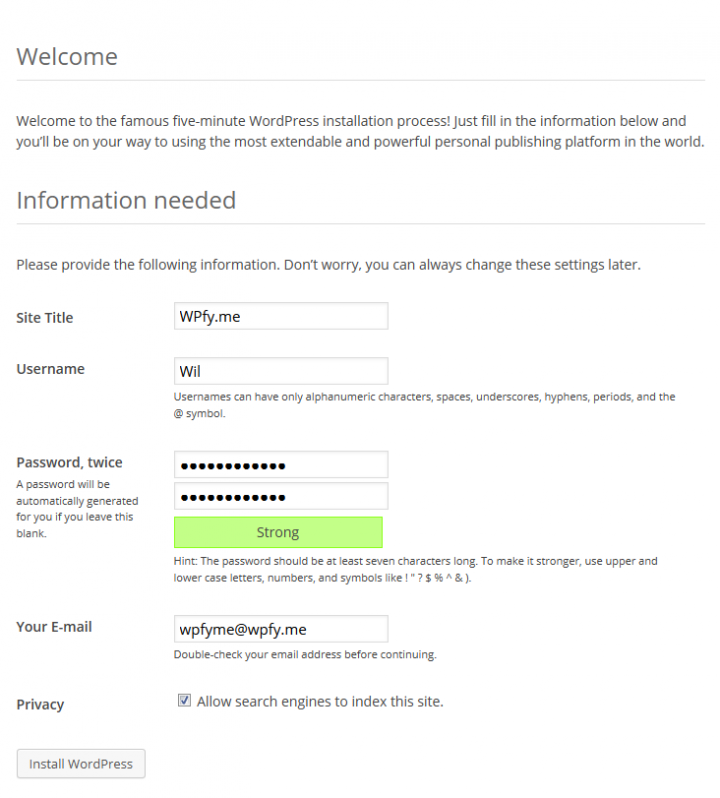 We are welcomed by WordPress’ famous five minute installation as shown in the screenshot above. Enter your details. You can change these later from the WordPress backend. When you see the WordPress’ Success! Screen, you know that you have succeeded and are done. Now you can log in with the username and password as entered at the five minute installation, and start enjoying WordPress – locally. Wil: this post and the XAMPP post are very clear. Thanks for your effort to make this available, so that I can give my FTP client and hosting account a rest. Good to learn the posts are helpful. Let me know if you run into any issues with the local setup.